Isaac Matthews has gone from skinny to ripped in only 2 years. 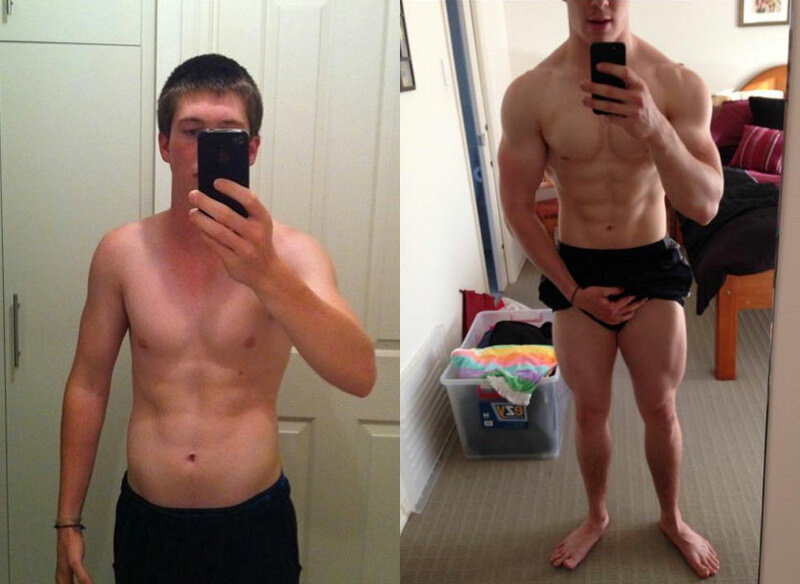 He put on 30lb+ of muscle and reduced his body-fat percentage by 4-6% at 5 feet 7 inches tall. Those are very respectable numbers, towards the upper end of what is achievable by a natural bodybuilder in that time. He is now 21 years old living in South Australia. In this interview you’ll gain lots of useful insights into what he has done to get where he is today. We asked him 17 questions, and you can read his answers below. But first, let’s see the progress photos. Since starting training in March 2011 (roughly 2 years) I have only gained about 25 pounds. However, I have dropped 4-6% body fat in the process. My starting weight was just shy of 130lbs, I now weigh in about 155 pounds. As far as lean mass goes I have gained more than 30 lbs. I have been training for nearly 2 years. The first 6 weeks were spent training at home and progress was slow, it was only until I joined a gym that I started to see proper progress as my equipment at home was limited. Has Your Progress Been Consistent? My progress has been relatively consistent; however the first 4-6 months were my most successful. 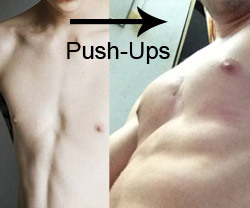 This is when “noob gains” play a huge role and muscle gain is at its peak rate. I made the mistake of not following a strict program in these first few months, so my strength and size have suffered because of that. How Have Your Lifts Progressed? The main lifts I focus on are the “big 3”, the bench press, squat and dead lift. Which have all progressed dramatically since I started training. My squat has always struggled and I have always had a strong chest. It was only up until recently that I have really got my squat form perfected and the numbers are coming on quickly. When it comes to measuring strength, I find it’s not about the weight you lift, it’s about the weight you lift in comparison to your bodyweight. 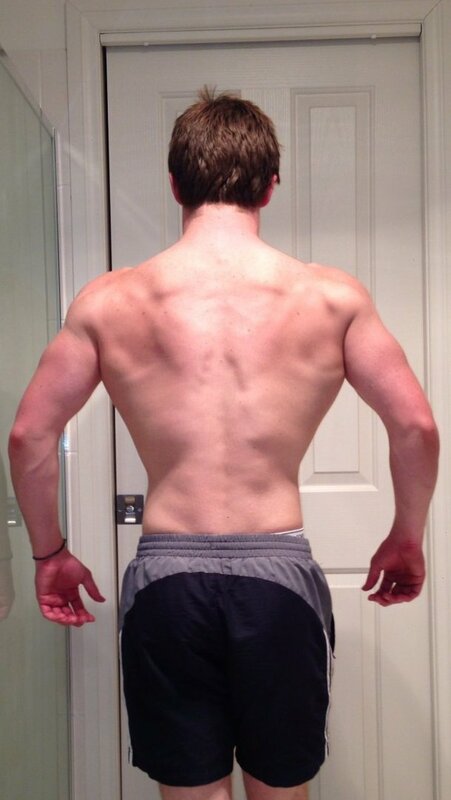 Which has purely been my focus, I judge/rate my progress based on my bodyweight to weight lifted ratio. How Frequently Did You Train? I made the mistake of starting on a split, when I should have trained full body 3x a week on non consecutive days. Muscles do not require as much stimulation for beginners, it is not necessary to hit each muscle with high volume in the first 6-12 months of training. One exercise per body part will suffice, and only 3 days training a week is needed. I have since trained new comers with this approach and their progress is the first 6 months has far exceeded what mine was in the first year. I am currently doing the “PHAT” Routine (Power Hypertrophy Adaptive Training), and have been for about the last 5 months, progress is just as good as ever and I really enjoying this style of training. How Intensely Did You Train? I have 2 dedicated strength days where the weigh is high, the reps are low and the breaks are long. These days are split into upper and lower, the intensity isn’t extremely high as there are long breaks, but the sets are tough and strenuous despite only being 3-5 reps. I also do 3 hypertrophy days, focused on high reps, lighter weight and shorter breaks. 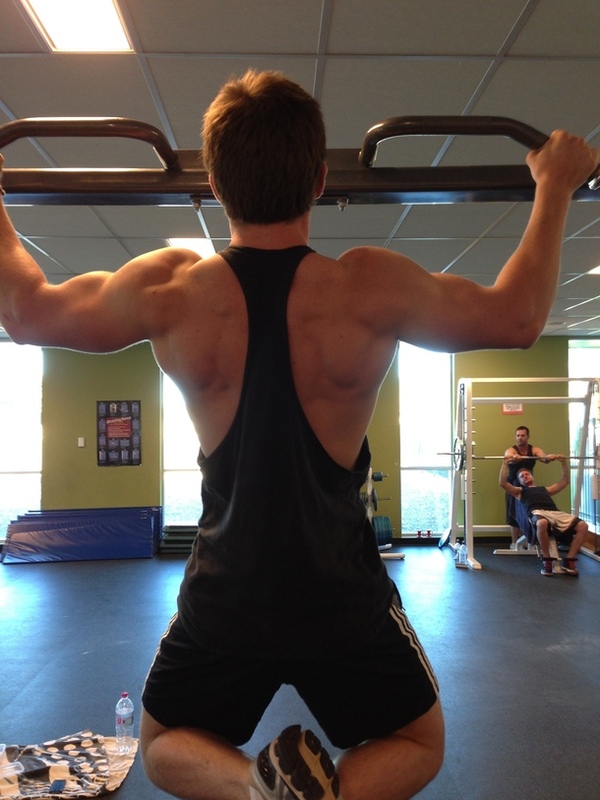 These are split into chest/arms, legs and back/shoulder days. I will focus on anywhere between 10-20 reps and have short breaks in between sets, this is extremely intense training and is designed for muscle growth. Do You Still Feel DOMS? I still feel DOMS, mainly in my legs, if you’re not struggling to walk a day or two after leg day, you’re doing it wrong! I have found since increasing the frequency of my training I do not feel DOMS as severely as only training each body part once per week, my body has adapted to the intensity. As mentioned before, my strength (or power) days focus on low reps, high weight and big breaks (up to 5-7 minutes between sets). This is purely to build a base for strength and lift as heavy as possible. I also do hypertrophy days which focuses on the contraction of the muscle, higher reps, big pump, short breaks. These days are the most enjoyable and are used to increase muscle mass. DO NOT EGO LIFT!!! Don’t compare yourself to others. Focus on full ROM (Range of Motion) with your exercises. Focus on the contraction of the muscle and form before the weight you lift. If an exercise cannot be performed with full ROM and proper form, it is simply too heavy! Drop back the weight and focus on technique. What Is Your Eating Like? I do not claim to have a perfectly “clean” diet. I do however eat to certain macros and calories EVERY day. I find the portions of food and their macronutrient content are far more important than whether or not they are labelled “clean” or “dirty” foods. Fibre content is important, if I reach my fibre, fat, protein and carb goals for the day I have no issues eating a few pieces of chocolate or some ice cream without feeling guilty or hindering results. This is not saying I eat nothing but McDonalds and Pop Tarts all day, it is saying assuming I meet sufficient fat/protein/carb and fibre goals I can still have ‘pleasure’ food without negatively affecting results. I simply cannot hit these goals with “dirty” foods which is why my diet mainly consists of what people would consider “clean” foods. The sooner people get the “clean vs dirty” mentality out of their head and focus more on their macronutrient/calorie/fibre goals the sooner they will enjoy their lifting/bodybuilding lifestyle more without having to eat nothing but chicken breast, brown rice and broccoli. Dr Layne Norton has some extremely informative videos on this, I encourage everyone to take the time to watch them, it is a huge eye opener for many. I currently sleep anywhere between 8-10 hours a day. We all know sleep is extremely important for training and muscle is built when we rest. I am able to sleep this much as my lifestyle/job/hobbies allow for it. I recommend people sleep as much as they can without sacrificing their job/hobbies. I would say 6 hours minimum would be a good number to aim for. How Did You Get Your Body Fat So Low? I don’t consider my body fat low enough!!! However getting a low body fat is easy. Maintain a calorie deficit as close to maintenance calories as reasonably possible with sufficient protein. Losing body fat is that easy. Add in refeeds weekly/bi-weekly depending on body fat levels to keep leptin levels from dropping and the metabolism firing. I am yet to see how low I can get my body fat to go as I haven’t tried yet, I believe I require more mass! I do VERY little cardio, I may throw in HIIT cardio 1-2 times a week when cutting to make it a little easier to chew through fat. Cardio, in my opinion, is only necessary for those who have want to eat more (adding cardio allows for a higher maintenance calorie count), those who struggle to lose body fat or those training for sport. During my last ‘cut’ I was able to drop over 20 in 12 weeks without one ounce of cardio, I simply lifted 5 times per week and maintained a calories deficit through diet. Are Supplements Important For You/Which Supplements Do You Take? Supplements mean VERY little to me, I am currently taking absolutely nothing in the way of supplements most days. I have a small amount of protein powder handy in case I struggle to meet my protein goals for whatever reason, but other than that I take nothing else. Supplements are exactly that… ‘Supplements’. They supplement what is insufficient, if one eats a balanced diet consisting of appropriate fat/carb/protein and fibre goals, there is no need for supplements. Multivitamin – Helps hit vitamin and minerals needs. Protein – Keep it handy for those days you don’t hit your protein goals through diet. What Tips Would You Give to a Newbie? Eat big. Sleep big. Rest big. Train full body 3x per week on non consecutive days. Simple as that. Don’t over analyse. Focus on compound lifts, ROM and form. Track your lifts to make sure you’re progressing and stay consistent. What Tips Would You Give to an Intermediate Trainee? Intermediate lifters should know what does and does not work for them. Stick to what you know works. Track your lifts, progressively overload as often as possible and stay consistent. In the end my success has come down to determination, patience and consistency. I plan on continuing my training and want to compete in the next few years. 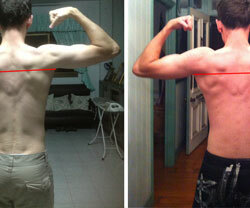 My Bodyspace link is attached (Squeak419 @ Bodyspace if you want to follow my progress. Stay tuned to see how thick, solid, tight I can get!!! Getting his compound lifts up from 130lb to 315lb (deadlift as an example), really helped him to gain mass. Consistency is extremely important, choosing a program that includes big lifts and sticking with it gets you a long way. Measuring lift progress as a ratio of body weight is a good point. In our article on sprint speed and strength we found that speed was strongly correlated with hang clean 1RM as a percentage of body weight. It applies to sport just as it does to body building. Using proper form, doing full range of motion and controlling the weight both up and down is very beneficial as seen in our Eccentric versus Concentric Contraction article. He tracks his macros and calories every day. He would not have made as much progress otherwise. He sleeps enough! Again, he would not have made the same progress otherwise. Some people think that 10 or even 8 hours is unnecessary, but there is strong evidence that 8 hours is superior to 6 hours, and 10 hours per superior to 8 hours. He says he takes no supplements while stating that Creatine is proven to work. Considering Creatine costs less than $0.10 per day (for 5g per day), there is little excuse not to take it. As he said, there is good evidence for Creatine’s benefits as seen here – Which Supplements Are Effective For Muscle Gains? Also as he said, whey protein is useful if you didn’t hit your protein macro requirement, but protein is also useful post-workout (check references 2 and 3 in that article). With his current training program, he would only need to take 5 scoops per week, not a whole lot. Sol from Examine.com recommends Vitamin D supplementation, since Vitamin D deficiency results in lower testosterone and 77% of US adults are deficient. If he chooses to take up those two recommendations, his results will be further improved. There’s little else to suggest though, since he has got everything down solidly already. For any beginners lifters out there, take note of what he says, because it’s all useful information. Even other people can pick up useful information in the interview. 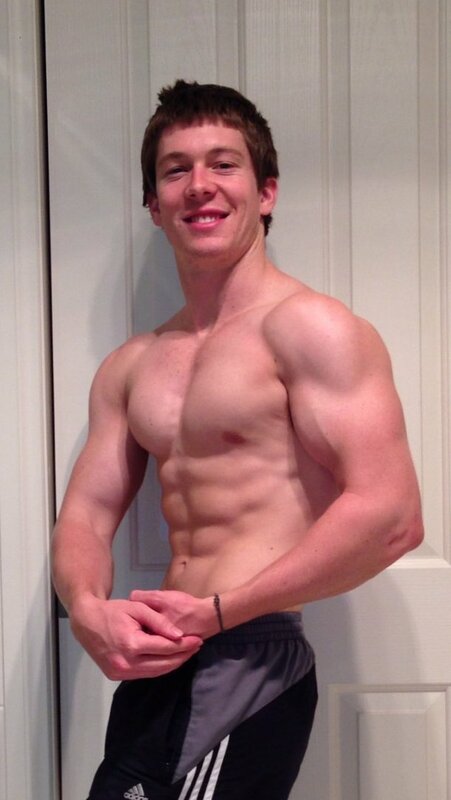 No Responses to "How to Get Ripped: Interview with Isaac Matthews"